Sukabumi green stone tiles price direct supplier contact whatsapp +62 853 369 06433 (Ms Putri). If you are looking for a private instalallation green Sukabumi stone tiles, will be the right option to choose. For inspiring how we install Sukabumi Green Stone Tiles, let's check this stunning project installation at Puerto Galera, Phillipines. Puerto Galera has some pocket beaches, snorkeling, and scuba-diving spots. Dubbed as a Man and Biosphere Reserve of UNESCO in 1973, this town in The Philippines has plenty of the most diverse coral reef diving sites in Asia. 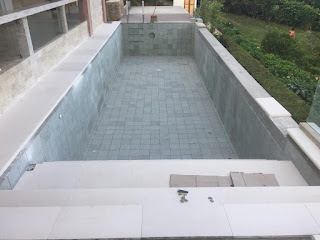 Since there are also many hotels and resorts with swimming pools, this town in Mindoro Island is in need of The Stone Depot Project - Green Sukabumi Stone Pool Tiles Project at Puerto Galera Philippines. With this project, Puerto Galera will not only have beautiful swimming pools that resemble stunning lakes like in paradise. They will also have a whole lot more than that. For starters, Green Sukabumi Tiles are beautiful and amazing stone tiles. They are also very rare. These tiles have huge benefits, especially for swimming pools. They can only be found in Indonesia and have been famous around the world. Plenty of countries in America, Australia, Asia, Europe and Africa have these tiles imported into their countries to be used. Now, it is The Philippines’ turn with the Stone Depot Project - Green Sukabumi Stone Pool Tiles Project at Puerto Galera Philippines. With these tiles, plenty of swimming pool tiles and wall tiles in their five-star hotels will have a natural green shade and coolness. Two types of green tiles can be used for the Stone Depot Project - Green Sukabumi Stone Pool Tiles Project at Puerto Galera Philippines.The first one is the green tiles with smooth finishing. They are placed for pool tiles and wet areas. They can either be sawn-cut or honed. The sawn-cut is less smooth than the honed because it is done by machine. You can choose the smoothness level from how much they are honed. The second one is the green tiles with rough-face finishing. This is for those who prefer natural appearance, even for your swimming pools and walls. 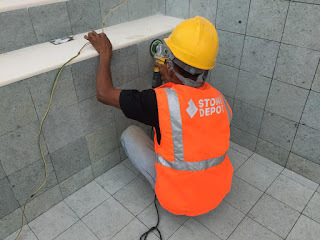 For the Stone Depot Project - Green Sukabumi Stone Pool Tiles Project at Puerto Galera Philippines, using these Sukabumi green tiles have plenty of other benefits. Their elegant-look makes the swimming pools look more inviting for a dip-in or a swim. They help to avoid swimmers from having a slip and a fall, a typical accident around the pool area. These green tiles also have high density but low absorption rate. They are water-resistant, so it is easy to clean them up as part of the maintenance. For a swim under the hot weather in Puerto Galera, these green tiles cool the water off. You can get Sukabumi green tiles in Stone Depot. 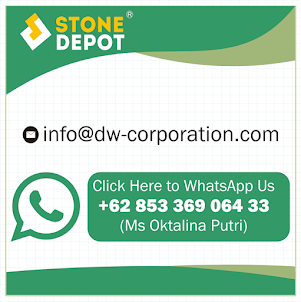 More details click How To Install Green Sukabumi Stone. Or please contact our email : info@dw-corporation.com (Ms Putri) or Whatsap +62 85336 906 433.